I’ve been wrestling with a thorny problem for awhile: how do I store my gradual color-change yarns? I typically have 25-30 shades in each color gradation, each in a 30 gram skein. Â Balls of yarn are inconvenient and tend to bounce around.Â I could put them on full-size cones, but that takes up a lot of space.Â I bought a bunch of small plastic cones on eBay, but they’re very delicate and shatter at the least provocation. I was going toÂ make my own cones out of paper, but that takes time and gets complicated. 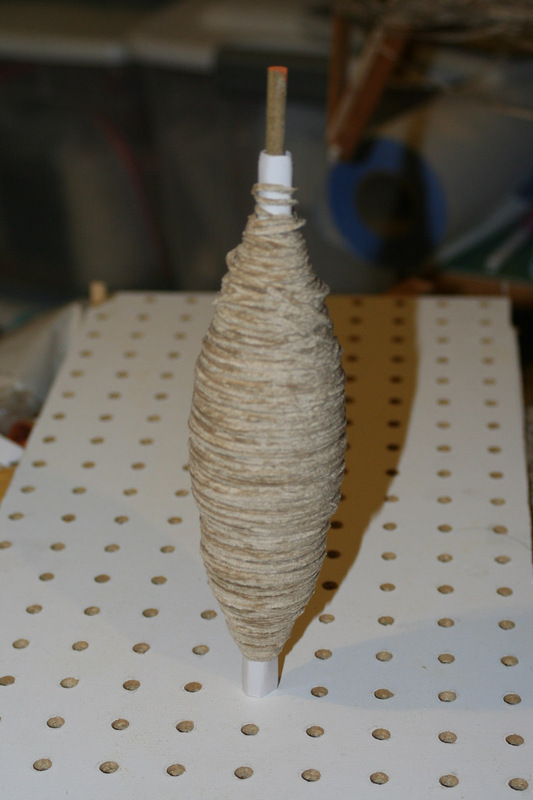 Finally it dawned on me that the cone shape was unnecessary!Â I could wind the yarns into a cigar shape on a simple paper core – basically, making a mega-pirn.Â With a stand to hold the pirn vertical, I could easily warp from it, or wind smaller pirns.Â This method wouldn’t work as well as cones for large amounts of yarn, but for the 30-gram quantities I typically dye for each skein, it would work beautifully. So I built a stand out of two layers of 1/4″ pegboard (carefully lined up so the holes matched exactly), wound a mega-pirn of the rayon chenille, stuck a 1/4″ dowel into the pegboard and mounted the mega-pirn onto the dowel.Â It works! !Â The only problem is a small tendency for the pirn to fly off the dowel near the end.Â I’m going to fix that by putting a rubber band on the end of the dowel. The pegboard turns out to be a good choice – it allows me a lot of flexibility in arranging pirns (in case I want to wind from multiple pirns) without drilling a lot of holes. I’m pleased.Â The mega-pirns will make for a very compact arrangement of yarn, and will allow me to stuff all my graduated colors into a single giant Zip-lock bag.Â Added bonus: no more purchasing cones!Â I rolled the center of the pirn from a sheet of cardstock, though I suspect a sheet of regular paper would also work.Â Cheap, easy, and fast.Â Super win!